(Newser) – What's worse than running into a karate dojo while trying to abduct someone? Trying to rob an MMA fighter is right up there. "#badf---ingidea" is how UFC President Dana White framed it, posting on Instagram a picture of 26-year-old Brazilian mixed martial arts fighter Polyana Viana next to the bloodied "guy who tried to rob her." BuzzFeed reports the incident happened Saturday evening in Rio de Janeiro, while Viana was waiting for an Uber. Viana tells MMA Junkie that as she waited in front of her apartment, the would-be robber first asked her for the time, then asked her to hand over her cellphone, claiming he had a concealed gun. Viana decided to call his bluff: "I threw two punches and a kick. He fell, then I caught him in a rear-naked choke. Then I sat him down in the same place we were before and said, 'Now we'll wait for the police.'" Next on Newser: A Dead Man Is Found at Home of Democratic Donor. Again. Implementing effective self defense speaks for itself. 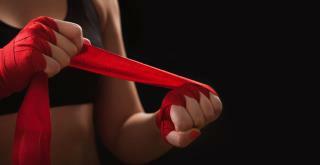 This MMA fighter also used her training to assess that the perp did not nave a real weapon.